Rainbow FM 90.7 Live Streaming Online . 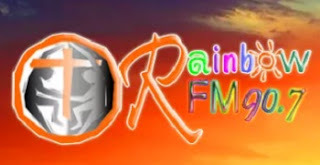 Rainbow Fm 90.7 is an adult Contemporary Radio Station that offers listeners on the West rand a professionally presented mix of necessary daily lifestyle information with easy listening contemporary Christian music . It can be heard over the entire West Rand Region which includes Roodepoort, greater Soweto, Randfontein, Krugersdorp, Northcliff, Sandton and Jhb central. Its programmes include various features from daily news headlines, weather financial reports, competitions, and more.